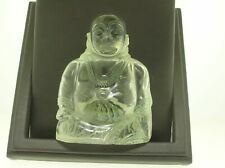 HAND CARVED OLD CHINESE QING DYNASTY ROCK CRYSTAL SITTING BUDDHA - 3 3/4"
THE HAND CARVED ANTIQUE ROCK CRYSTAL QING DYNASTY STANDING BUDDHA IS IN EXCELLENT CONDITION THE BUDDHA STAND 3 3/4" TALL BY 2 7/8" WIDE. TOTAL WEIGHT IS 392.9 GRAMS. A collection of 3 wooden objects consisting of a rather attractive double gourd vase depicting the 8 immortals and a trigram motif to the base. A carved dragon wooden brush rest and a wooden buffalo with glass eyes. However cheques and wire transfers are also acceptable. STATUE SIZE: APPROX. VERY GOOD CONDITION. IT IS A GREAT PIECE FOR USE OR DISPLAY! No matter what problem you have, we will solve it carefully and quickly. Sincerely look forward to your understanding. The item pictured is always the similar item you will receive. Weight (Approx) 1250g. Very old Jade Netsuke.Mokugyo fish gong with Ironi. This Netsuke is modeled after a fish gong. Item listed for sale is a unique Chinese hand carved rock crystal rabbit. The rabbit has its hind legs raised with its nose to the ground. The rabbit sits on a well carved wood stand. Chinese Crystal Rabbit. This is a very rare translucent hetian jade carving of a Fortune Bat riding on a Pi Xiu. In the Chinese culture, the jade is believed to have the power to bestow on its owner good luck, good health and happiness perpetually. This is a very rare translucent hetian jade carving of a recumbent goat with a kid. In the Chinese culture, the jade is believed to have the power to bestow on its owner good luck, good health and happiness perpetually. This is antique very old pure natural himalaya hand carved crystal stone door handle. This is a jadeite carving of a fish for sale (acrylic stand in the photo isNOT included). This jade carving would be a great addition to your art collection. In the Chinese culture, the jade is believed to have the power to bestow on its owner good luck, good health and happiness perpetually. This jade carving would be a great addition to your art collection. We endeavour to provide the best product and service to you. This is a translucent jadeite carving of a pair of mandarin ducks, lotus flower and ruyi (acrylic stand in the photo isNOT included). This jade carving would be a great addition to your art collection. This is a translucent jadeite carving of a fortune bat and a fish is carved on its body (acrylic stand in the photo isNOT included). This jade carving would be a great addition to your art collection. Old jade carving Statue. Chinese ancient jade carved statue,in good condition. 7.0" 3.3" 2.6" (18cm 8.5cm 6.5cm). This is a translucent jadeite carving of a fortune bat and peach (acrylic stand in the photo isNOT included). This jade carving would be a great addition to your art collection. In the Chinese culture, the jade is believed to have the power to bestow on its owner good luck, good health and happiness perpetually. 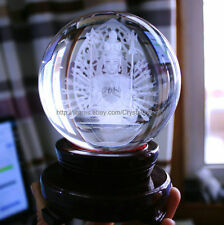 For sale is a beautiful Chinese rock crystal hand-carved Guanyin in excellent antique condition. This piece is excellent otherwise and looks to be from the 19th century. 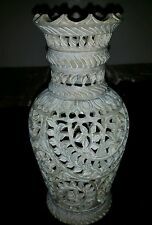 Very ornate and detailed piece. Chinese translucent Jade dragon in the wheel, Warring States(?). Age: Attributed to Warring States or earlier(?). The dragon (long 龙) is one of the twelve animals of the Chinese zodiac. The dragon is believed to live in the mountains or in the seas and can fly into the heavens. 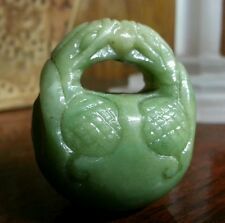 This is a very rare translucent hetian jade carving of a goat belt hook. In the Chinese culture, the jade is believed to have the power to bestow on its owner good luck, good health and happiness perpetually. This is a translucent jadeite carving of a fish, gourd and peach (acrylic stand in the photo isNOT included). This jade carving would be a great addition to your art collection. In the Chinese culture, the jade is believed to have the power to bestow on its owner good luck, good health and happiness perpetually. This is a translucent jadeite carving of a pair of mandarin ducks, lotus flower and a fish (acrylic stand in the photo isNOT included). This jade carving would be a great addition to your art collection. This is a translucent jadeite carving of a kid climbing the gourd with a fortune bat (acrylic stand in the photo isNOT included). This jade carving would be a great addition to your art collection. In the Chinese culture, the jade is believed to have the power to bestow on its owner good luck, good health and happiness perpetually. This is a wonderfully carved rock crystal Buddha statue! Set in a red resin base. Lots of great detail! The crystal "sphere" can be gently spun around. I am not sure of the age of this piece. It could be older but I am no expert. NOTE: The number at the beginning of the Title does not indicate quantity. VERY NICE PIECE FOR A COLLECTION. My collection includes the China's 56 nationalities. Material : Natural Crystal. No exceptions. View More. My Profile. Material: Brass Copper. Condition:Very Good.